Skydiving was one of my bucket list. I thought that this was the highest level of extreme sport. Because skydiving is expensive, the most important thing was where i will do this crazy thing? based on my research in the Internet that New Zealand is one of the best place to do it. The glacier towns in the West coast of NZ, Franz Josef and Fox Glacier, is ranked as the second best drop zone for skydiving in the world after Himalaya region. I don't care that it is true or not but you can expect full package of scenery, ocean, forest, river, mountain, glacier! 10:00 - 13:00 : 16000 ft SKYDIVING!!!!! with Franz Josef Skydive. they claim that they have the highest drop point in the country, 19000 ft! 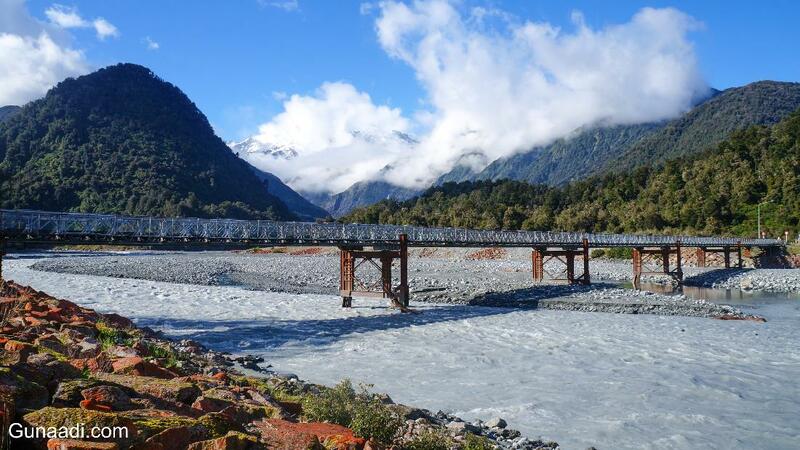 16:00 - 19:00 : taking 2 way bus to the view point of Franz Josef Glacier. 19:00 - 23:00 : Nothing to do and hoping someone approached me. Previously, i thought Naked bus had service to the west coast because it was showed it in their site. In fact, the service was not available (as per December 2015). I counted Intercity for this journey. However there are some small buses travelling among the town but Intercity was the cheapest. The town is even smaller than other town i visited before. No public buses in the town. You are only able to walk for getting around. Franz Josef or Fox Glacier ? Both of the glacier town is almost same. I chose Franz Josef instead of Fox is because of economical reason, there was a skydiving discount in bookme site. I can give some comparison that i know from my previous research and the actual experience in Franz Josef for your early information. i would suggest to look out the Internet for an update. The highest drop point is 19000 ft! The journey was around 6-7 hours started 9:45 until 16:30 using intercity. I thought Naked bus had service to Franz Josef because the route was shown in their site but i couldn't book it. Then, i tried to contact them. They said the service was not available anymore. Damn! i should spend some money for Intercity. It was a long journey and i might got bored. I thought it was common bus service but i got more than that. It was like a tour like what i felt during my Milford Sound trip. The driver was a guide and we made some stop for sightseeing place like a river and waterfall (it was just normal river and waterfall actually). We also stopped to 2 restaurants in the middle of nowhere (seriously, nothing around the restaurant..the customer might be only from the bus) for breakfast and lunch. One of the name of the restaurant was South west land salmon. The place was combining farm, cafe and shop in one place. I like the food and the cafe ambient even it was in the middle of no where. 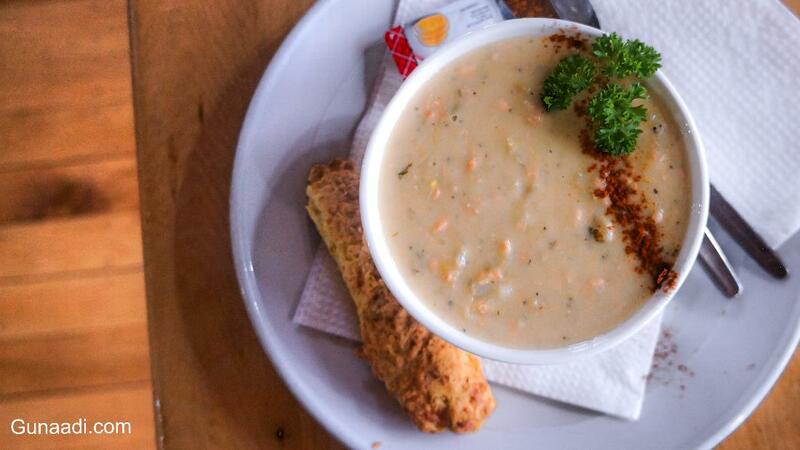 I tried Fresh Salmon Chowder for 13 NZD because they said that this menu was their specialty. The food was kind of Salmon soup served with a bread roll. It was delicious. The soup melted inside my mouth and sometimes burn my tongue because it was still hot! I recommended it! The town was very small comparing other town that i visited before. I only needed 1 hour to circle the town including stop for checking some shop. There were West coast wildlife center in Franz. You can see the rarest Kiwi bird inside. The next day was the the day that i was waiting for. The day that i would do the most craziest thing ever in my life, SKYDIVING!!!! The only provider ran this business was Franz Josef Skydive. it was cost me 329 NZD for 16000 ft (original price was 419 NZD... i got discount from Bookme.co.nz) including pick up and return. The bad thing was i could not bring my own action cam. I needed to pay another 150-200 NZD to get proper photograph/video by their own equipment. For sure, i would not take that. I was nervous and thinking about how stupid i am ... sacrificing my life and paying that lot of money. They said that i needed to come before 10 AM. I decided to come earlier. The bus came and brought me to the nearest airfield. I got the last waiting list. damn! The boarding time was came. The plane was small and propeller type. The flight took around 15 minutes until reached 16000 ft. The view outside the window was amazing! but i didn't care especially when the plane passed the cloud. It was shaken!!! My instructor said that the free fall duration would be 60 second! My tandem instructor was from japan. He was really Japan native so sometimes his pronunciation was difficult to understand. Suddenly, my instructor said "ok, jump now!". then both of us jump! Agghhhhhhhhhh!!! the next 5 minutes, we fall slowly until reached the ground. it was amazing experience! Believe me you must try it at least once in your life! After landed, they would show us the video when we were free fall on their TV. I considered to record it using my camera. It was the free option to get my picture while i was skydiving. Even though the quality was not good, at least, i still had a proof to show to my friends. I did this track first while waiting bus to Franz Josef glacier Valley track. It was 2 hour trekking until reached the tunnel. The receptionist said i could see the glow worm inside the tunnel. The tunnel was flooded and very dark. I could not see any glow worm there. Maybe, today was not my lucky day. I decided to go back to town. 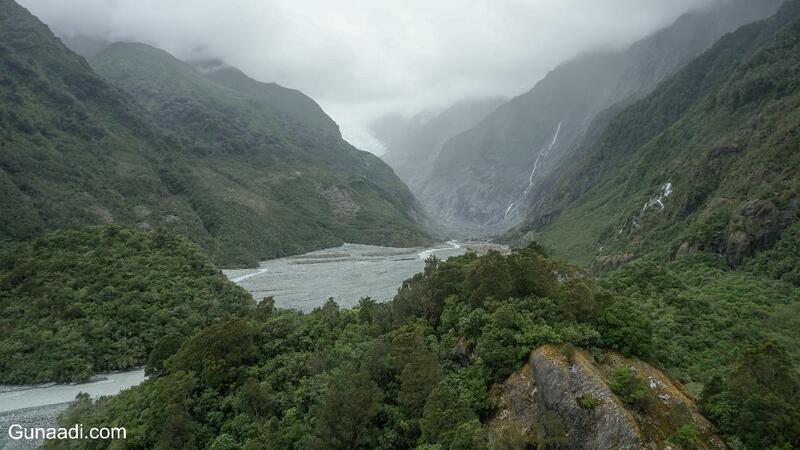 This is the cheapest option to see Franz Josef glacier but you can not walk on the glacier. it is located 10 minutes drive from the town. I took bus to reach there that ran every 2 hours. Too bad the track was closed in the half track because of the river flow was too high so i was only able to see the glacier far far away. I was in the same room with Argentinians. They was working holiday working visa holder means that they got 1 year visa and could be used to work informal jobs like room service, cashier, cleaning service etc. I also met with a Malaysian, Jojo that hold the same visa also. They used the visa to travel around the country. They stayed around 1 month in 1 town for working then move to other town and do the same thing so they could cover their needs. The bad news is Indonesian can not applied it!